Gossip Stone: What Can We Expect From Future Bosses? Bosses are some of the most judged things in Zelda nowadays. There are some parts of each game that stick in people’s minds and make the heaviest impact, and many of those things are that particular game’s bosses. Recently, Skyward Sword gave us some of the most praised AND most hated bosses in the series, and A Link Between Worlds brought us both new bosses, and classic ones with an added twist, but what next? What styles and gameplay should the new upcoming Zelda bosses use? Join the discussion below! Honestly, bosses in many series, not just Zelda, are showing off “weak points” more and more often. It is a shame that so many games make difficuly curves based on merely the most casual market, so things like bosses get dumbed down. Remember back in the day when loads of Zelda’s bosses were beaten with no more than your sword, or there was at least some clever, but subtle, clue as to how to hit them in some weak point? Those were some of the best ones. 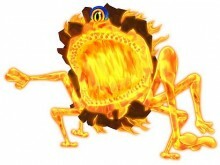 Now, games like Skyward Sword give us bosses with the most obvious weak spots conceivable, like Tentalus. Then again, there are also ones like Ghirahim that are not so much about weak points and item utilization, and more about skilled control. Those are the harder, and more fun ones, since they are a good challenge, and they don’t treat you like a moron with an obvious pressure point. A lot of the time, bosses like that, the ones based solely on skill, are the smaller ones. Giant bosses, which are expected in Zelda most of the time, are often the ones that require some specific item, and show you exactly where to hit it. 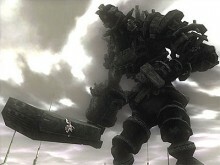 Personally, I often think that these bosses should take from a game like Shadow of the Colossus. The bosses in this game are ALL huge, and while they have specific weak points, they are hidden until you reach them. You must direct yourself to the general area of the pressure points, and then climb atop the hulking things. Finally, you use nothing more than a bow and sword to destroy the creatures. That is a great system. Simple, epic, and it doesn’t treat you like an idiot. Zelda Wii U is a wonderful chance for Nintendo to try new things like this, and to experiment with their bosses. Perhaps they will end up creating ones not as generic and cliched as some fans think are what Zelda is going to produce from now on. What do you guys think? Are bosses getting to dumbed down these days? Should Zelda be more creative with their monsters, and if so, what should be done? Leave a comment below!